Tonight when I got home from work my mom and I had a conversation that seems to be repeating itself quite frequently as of late. Me: Are you planning on going to the grocery store? Marilyn: Why? What do we need? Marilyn: Well I’m not going so take my credit card and shopper’s club card and go. Get milk. Of course this was the outcome I was going for, anyway. My mom thinks if we have milk and cereal we are STOCKED. I get to joyride down to Fairmount and frolic through Wegmans picking up whatever my little heart desires. I spent the weekend visiting my roommates on Long Island and I wanted to replicate the meal I had on Friday night at my friend Danielle’s house. Whenever we cooked a “real dinner” at school, it was always chicken cutlets, Rice-a-Roni, and broccoli. And it never got old. When I visited, we had those chicken cutlets with arugula sald, roasted potatoes, and corn on the cob. Delicious. I tried to be as much like Danielle and Tina (her mom) as possible by preparing the meal with a dish towel over my shoulder. I started by cooking a few cloves of garlic in the oil to infuse the flavor and then removed them before adding the chicken. As Anne Burrell would say, after they “fulfilled their garlic destiny”. 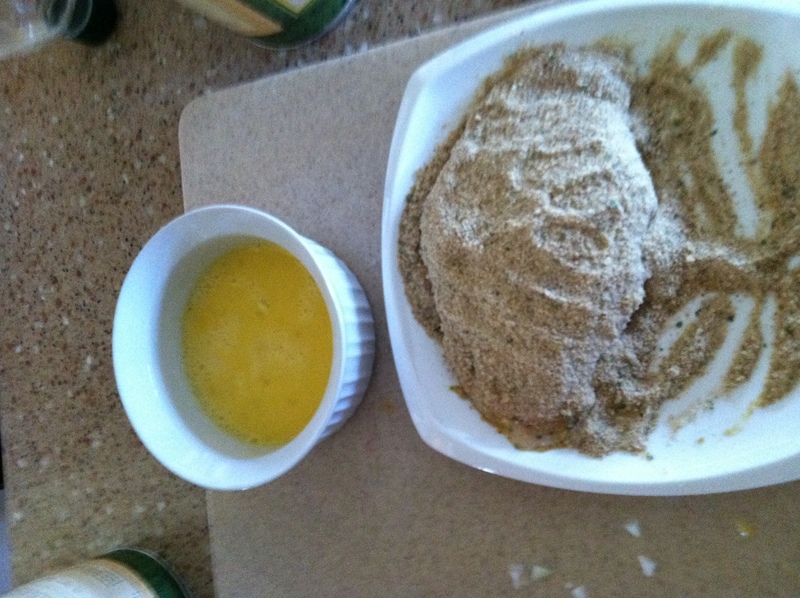 After butterflying the chicken breasts into thinner portions (or you can buy thin cut chicken) I dip them in egg and then coat them in bread crumbs. I use a mix of seasoned bread crumbs and parmesan cheese. 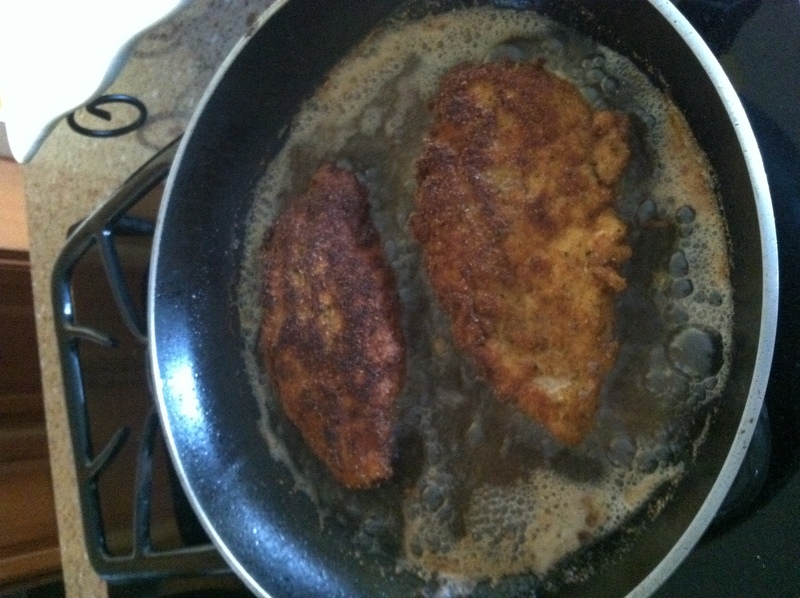 I’ve also made them with panko- it just gives a different texture. Then place them into the hot oil, without overcrowding the pan. Cook 4-5 minutes on each side, depending on how thick the chicken is. Place them on paper towels on a plate and then cover with more paper towels. This soaks up any extra oil and keeps them warm as you cook the rest of the chicken. I dressed the arugula and baby spinach mix with a little bit of olive oil, fresh lemon juice, salt and pepper. 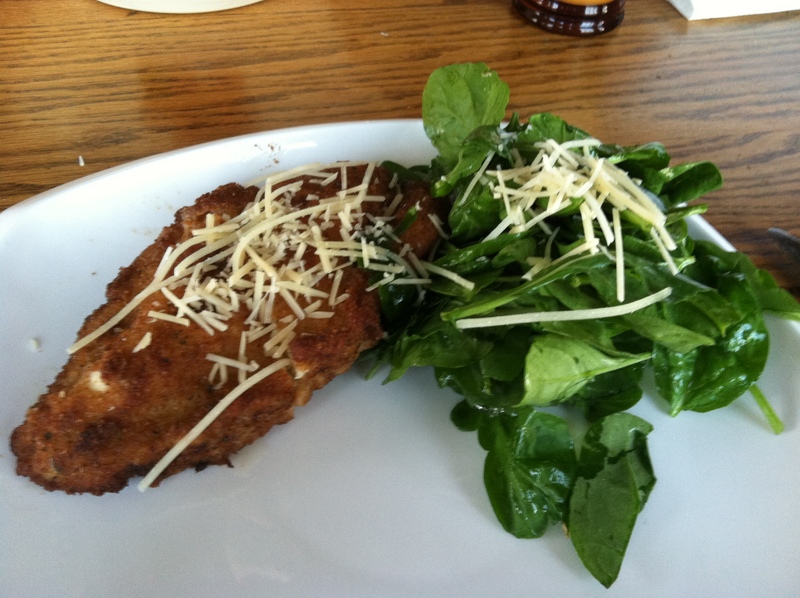 The peppery flavor and freshness of the arugula with the acidity of the lemon juice is a great balance for the chicken. If you order this dish in a restaurant (if you’re in Syracuse I recommend it at the Coppertop it’s fabulous) they shave some fresh parmesan on top. I didn’t have any fresh so I just used grated, because any cheese is better than no cheese. After my little vaca to Long Island I felt like I gained 15 pounds, and my parents felt the same way after spending the weekend at the lake considering we insist on eating 6 full meals every day that we’re out there. And drinking heavily. And laying in the sun. Healthy behavior. I guess it doesn’t make sense for me to consider fried chicken as a healthy meal, but since it was on top of something green it felt refreshing. If you’re wondering if my parents think it’s weird that I photograph my food while we eat, you would be correct. But of course, then it was time for dessert five seconds after I finished the dishes. I opened the pantry and saw a match made in heaven. I couldn’t believe I hadn’t thought of it sooner. Don’t worry Stacy, I’d get naked for chocolate, too. Just kidding.. maybe. This isn’t a recipe as much as a stroke of genius. I melted chocolate chips in the microwave and used a spoon to cover the chips, leaving only a small corner for grip-access. 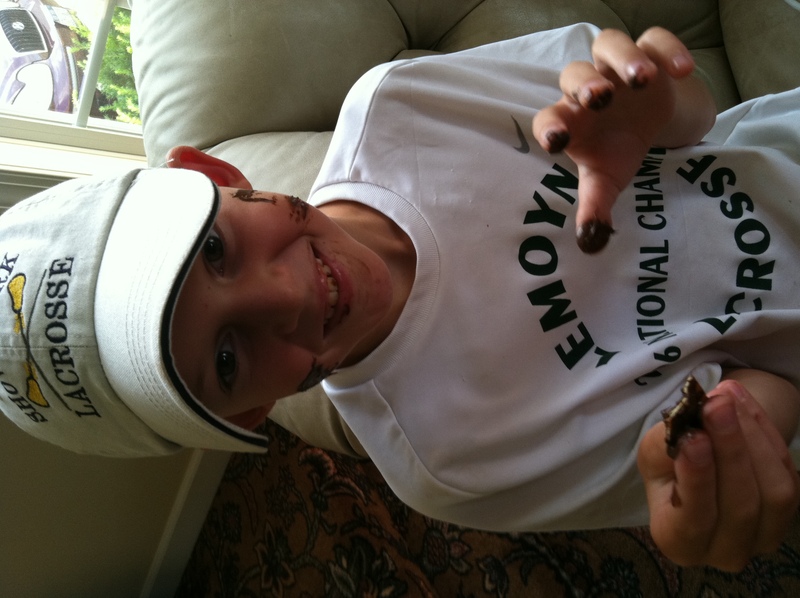 And when I ran out of room on my little plate I didn’t eat the rest of the melted chocolate with the spoon or anything. I stuck them in the freezer and then changed into my workout clothes while I was waiting so that I would actually exercise instead of repeating the process with the rest of the chips (both pita and chocolate). They were phenomenal. 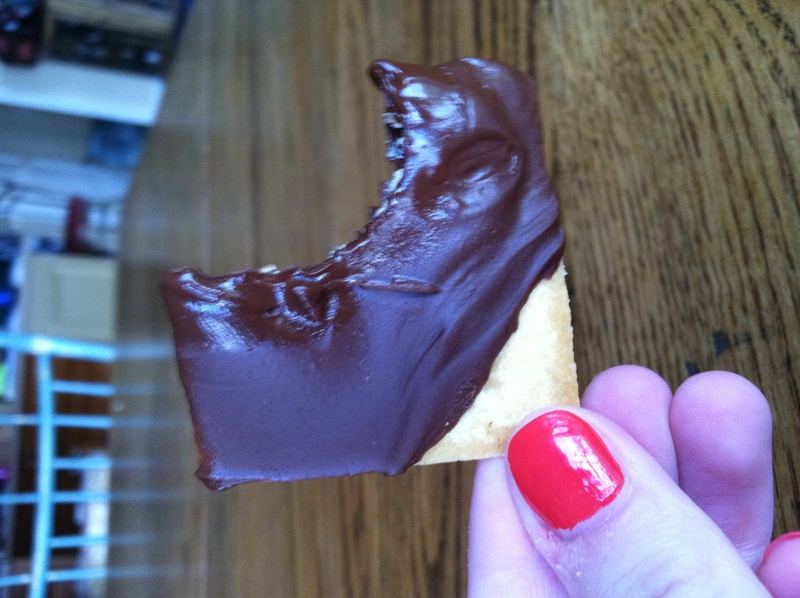 And also extremely rich (probably due to the thickness of the layer of chocolate I applied) so I shared. I’m such a good sister. I’m still deciding which is a better compliment to these chips- the chocolate, or guacamole. Maybe I’ll just alternate back and forth. Is that gross? I’ll let you know. No recipes in this post. I trust you to figure out the proportions, and also I’m trying to split my attention between this and The Bachelorette season finale. Priorities.